I mean, I do. Gosh, any world without tortillas is one I do NOT want to live in. But you don’t need tortillas. At least, not for this “burger,” anyway. And it’s actually how this burger came about. Fajita Night with tortillas that ended up being moldy easily turns into Fancy Burger Night. Cheesy, messy, fork-and-knife Fancy Burger Night. And while we’re confessing super, insanely deep things: Can you believe I almost didn’t serve these on a bun? The defeat of finding that those fresh-made tortillas weren’t so fresh after all, I nearly made the fajitas into a salad. Cooler heads prevailed (thank you, Jason!) and we ended up with Queso-Smothered Chicken Fajita “Burgers” instead. And it was a good thing, too. Because 1) Those tortillas had inflected a pain that only a messy burger could fix. And 2) EAT ALL THE CARBS AND CHEESE AND MORE CARBS. 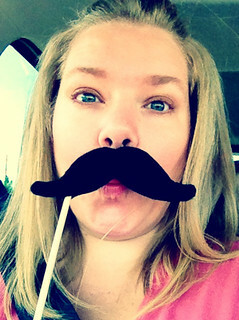 Because guess who has 2 half-marathons on the calendar, a dried queso drip down the front of her shirt, and a belief that, after 2 cherry margaritas, mustache selfies will never get old? 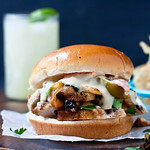 Juicy chicken fajitas smothered in queso and served burger-style. Brush the chicken with oil and season with salt and pepper. Toss the vegetables with oil and season with salt and pepper. Grill the chicken 6-7 minutes each side, until juices run clear. Grill the vegetables on a vegetable pan next to the chicken (or a double-folded sheet of foil with a few holes poked in it), stirring occasionally, until nicely charred. Let the chicken set at least 5 minutes before slicing. 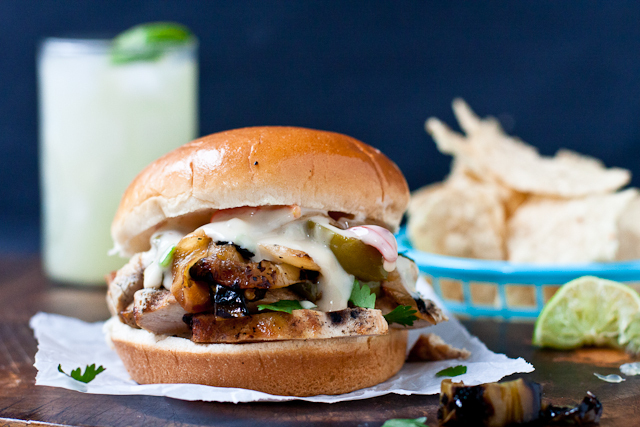 Top each burger bun with sliced chicken, a generous mount of vegetables, a squeeze of fresh lime juice, and a scoop of melty queso. Serve with a fork, knife, and my favorite skinny margarita. 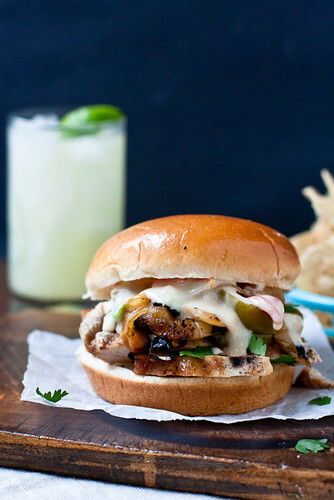 I would have never thought to put fajitas on a bun! Genius! Oh my! My son will LOVE this. Thanks so much! Pinning right now! My mouth is watering!! 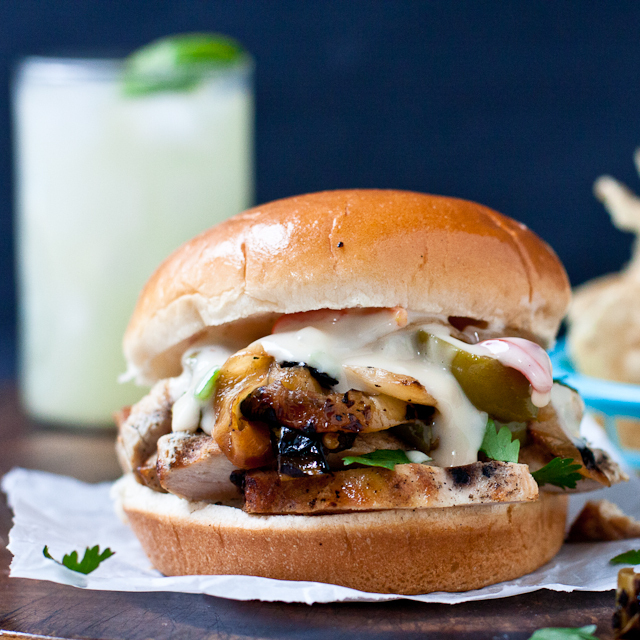 This looks incredible and what a genius idea to make fajitas into a burger! Mmm, love this! I’ve never been a fajita fan but as a burger? Yep, I could get into it! Oh my, this looks amazing!! Your pictures are gorgeous, as usual! I like this cheese and carbs mentality. And a burger without a bun is barely a burger at all! Yay for turning this moldy situation into something delicious! Oh my gosh. I must have these. The cheese! It’s just oozing out all over the place demanding to be devoured while oozing all over your hands.